Measurement technology requirements? Order your standard pressure gauges easily and directly from us - with the WIKA quality you are accustomed to. WIKA is a world leader in the manufacture and development of pressure gauges. With WIKA you will also find the appropriate instrument for the measurement of differential pressure. 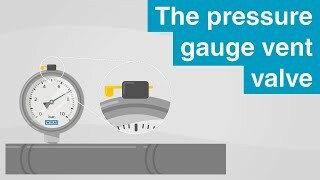 Differential pressure gauges measure the difference between two pressures. They are suitable for the monitoring of filter contamination, for level measurement in closed vessels, for overpressure measurement in clean rooms, for flow measurement of gaseous and liquid media and for the control of pumping plants. 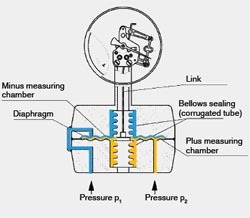 In differential pressure gauges, different pressure elements and tube forms are used (diaphragm element, capsule element, Bourdon tube, etc.). This enables scale ranges of 0 ... 0.5 mbar up to 0 ... 1,000 bar to be covered, with a very high single and dual-sided and also bidirectional overpressure safety up to 400 bar. 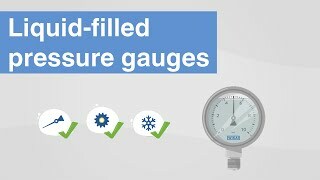 Alongside the standard variants of differential pressure gauges, in the WIKA portfolio you will also find a pressure gauge for the measurement with integrated working pressure indication. For filter and pump monitoring, the working pressure often plays a major role along with the differential pressure. In the DELTA-plus differential pressure gauge, a working pressure indication is therefore integrated. The working and differential pressure can be read simultaneously on on-site displays. An additional measuring and sealing point is thus no longer necessary.